A sign lets you know that you are on the right track to the Hoo Doo Trail that takes you on Highway 10 for twenty-five kilometers. The Hoo Doos are very fragile sandstone pillars with a large stone that sits on top which have been created over millions of years. Hoodoo Trail Sign, East Coulee Drive, Drumheller, Alberta, Canada, North America. 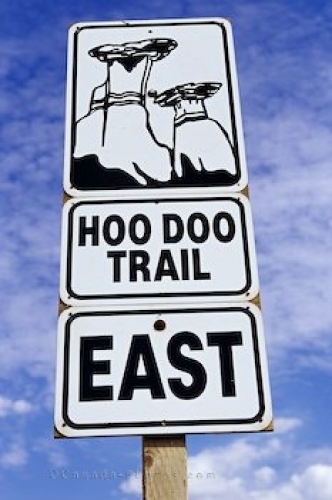 Picture of the Hoo Doo Trail sign in Alberta, Canada.